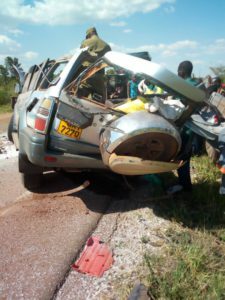 The wreckage of the Toyota Prado vehicle that was involved in an accident on the Gulu-Kampala road. Photo by David Okema. KIRYANDONGO–Five people this afternoon perished on Gulu-Kampala road in an accident involving HMK bus UAQ 045Q and a Toyota Prado, Reg. No UAY 727Q at Wakisanyu village in Kiryandongp district. The accident happened at 12:50 pm today. Police has only identified three of the deceased as Coporal Ronald Atwebembeire Gashom, the driver of the Prado vehicle and a police officer attached to Kampala police headquarters, and the others as Robert Irumba, a resident of Kireka in Kampala and Moses Mukwaya, a resident of Lwero district. They were aboard the Prado vehicle which was traveling from Gulu heading to Kampala. A source from Gulu HMK office revealed that four people from the bus got injured but cannot establish the magnitude. ASP Allan Julius Akiza, the Albertine region police spokesman, confirmed the incident and added that it happened when the Prado tried to overtake three vehicles ahead and collided head-on with the bus. “The Prado was overtaking the three vehicles ahead of it and collided with the bus. Five people perished from the Prado and one survived and also three people from the bus got injured,” ASP Akiza said. He said the victims were rushed to Kiryandongo hospital as police tries to establish their identity using their National ID card. He said police cannot yet confirm if the incident happened because of reckless driving, adding that investigation is underway as both of the vehicle are still at the scene.